This is an effort to organize, refine and test the notes, diagrams and reference materials from the last 12 years of teaching art & design. The long term goal is to publish an interactive ebook. Many, if not all, of the posts will change throughout this process whether it be editing for clarity, corrections or cross linking posts. You’re questions and comments are welcome. As with reading (and math) we must understand the alphabet, vocabulary and grammar before we get to meaning, interpretation and negotiation. This visual grammar is where we will focus most of our energy. From the beginning artists have passed along hard earned conventions and methods for successful visual communication. Recent understanding of human physiology, in the fields of cognitive science and perceptual psychology, dove tail with many of these conventions and help reinforce their success. Yes, the title is provocative. Some of the material can be polarizing. Most of the information will be supported by empirical evidence. Some content will only be supported by rationalization i.e. it’s likely the case but cannot be proven. 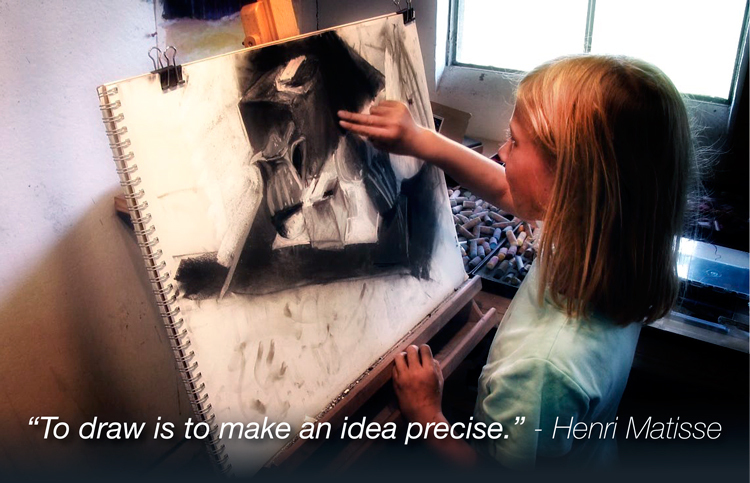 It may help to consider it all “a” way to teach art rather than “the” way. Or, as a set of tools along with their applications, strengths and weaknesses. There are no rules to art. There are rules to human perception. For 35 years I’ve witnessed and participated in both the process and the product of contemporary art education at the elementary, middle and high school levels, the undergraduate and post graduate levels and private workshops and community art center classes. In all that time and in all those places I’ve yet to see a coherent system, where the parts relate to the whole as well as to other disciplines, for facilitating visual literacy that can begin in kindergarten and be built upon to professional application. It’s only in the last 50 years or so that we’ve lost this appreciation for relationships.